An assist is credited to the player tossing the last pass leading directly to a made field goal, but only if the player scoring the goal demonstrates an immediate reaction toward the basket after receiving the pass. Note also that an inbound pass can be credited as an assist if it leads directly to a field goal. By rule, no more than one assist can be credited for each goal. 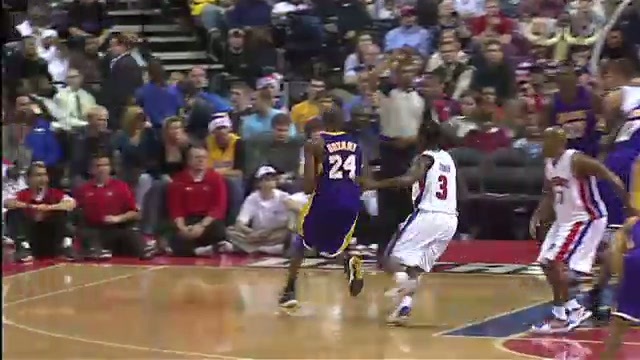 On this play, #24 in the purple uniform recevies the inbound pass, jab steps, and then makes the jump shot. An assist is credited to his teammate, #37 in the purple uniform, since an inbounds pass can lead to an assist and the shooter demonstrated an immediate reaction towards the basket upon receipt of the pass.